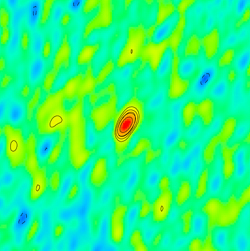 This image composites XMM-Newton X-ray data onto an optical view of the Andromeda galaxy; the ULX is circled. Colors in the XMM image correspond to different X-ray energies: 0.2 to 1 keV (red), 1 to 2 keV (green) and 2 to 4.5 keV (blue). Credit (background): Bill Schoening, Vanessa Harvey/REU program/NOAO/AURA/NSF Credit (inset): ESA/M. Middleton et al. A newly published study reveals the first detection of radio-emitting jets moving at more than 85 percent the speed of light from a stellar-mass black hole outside our own galaxy. Back in January, a new X-ray source flared and rapidly brightened in the Andromeda galaxy (M31), located 2.5 million light-years away. Classified as an ultraluminous X-ray source (ULX), the object is only the second ever seen in M31 and became the target of an intense observing campaign by orbiting X-ray telescopes — including NASA’s Swift — and radio observatories on the ground. These efforts resulted in the first detection of radio-emitting jets from a stellar-mass black hole outside our own galaxy. A ULX is thought to be a binary system containing a black hole that is rapidly accreting gas from its stellar companion. However, to account for the brilliant high-energy output, gas must be flowing into the black hole at a rate very near a theoretical maximum, a feeding frenzy that astronomers do not yet fully understand. The ULX’s radio-emitting jet (center) is unresolved in this image constructed from Very Long Baseline Array data. Each side of the image is 20 milliarcseconds across, or about the width of a human hair seen from a distance of half a mile. Credit: NRAO/M. Middleton et al. As gas spirals toward a black hole, it becomes compressed and heated, eventually reaching temperatures where it emits X-rays. As the rate of matter ingested by the black hole increases, so does the X-ray brightness of the gas. At some point, the X-ray emission becomes so intense that it pushes back on the inflowing gas, theoretically capping any further increase in the black hole’s accretion rate. Astronomers refer to this as the Eddington limit, after Sir Arthur Eddington, the British astrophysicist who first recognized a similar cutoff to the maximum luminosity of a star. “Black-hole binaries in our galaxy that show accretion at the Eddington limit also exhibit powerful radio-emitting jets that move near the speed of light,” Middleton said. Although astronomers know little about the physical nature of these jets, detecting them at all would confirm that the ULX is accreting at the limit and identify it as a stellar mass black hole. The European Space Agency’s XMM-Newton observatory first detected the ULX, dubbed XMMU J004243.6+412519 after its astronomical coordinates, on Jan. 15. 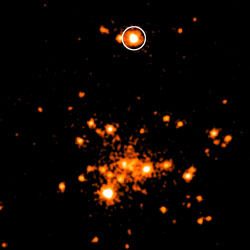 Middleton and a large international team then began monitoring it at X-ray energies using XMM-Newton and NASA’s Swift satellite and Chandra X-ray Observatory. The scientists conducted radio observations using the Karl G. Jansky Very Large Array (VLA) and the continent-spanning Very Long Baseline Array, both operated by the National Science Foundation in Socorro, N.M., and the Arcminute Microkelvin Imager Large Array located at the Mullard Radio Astronomy Observatory near Cambridge, England. In a paper published online by the journal Nature on Wednesday, Dec. 12, the scientists reveal their successful detection of intense radio emission associated with a jet moving at more than 85 percent the speed of light. VLA data reveal that the radio emission was quite variable, in one instance decreasing by a factor of two in just half an hour. “This tells us that the region producing radio waves is extremely small in size — no farther across than the distance between Jupiter and the sun,” explained team member James Miller-Jones, a research fellow at the Curtin University node of the International Centre for Radio Astronomy Research in Perth, Western Australia. Black holes have been conclusively detected in two varieties: “lightweight” ones created by stars and containing up to a few dozen times the sun’s mass, and supermassive “heavyweights” of millions to billions of solar masses found at the centers of most big galaxies. Astronomers have debated whether many ULXs represent hard-to-find “middleweight” versions, containing hundreds to thousands of solar masses. 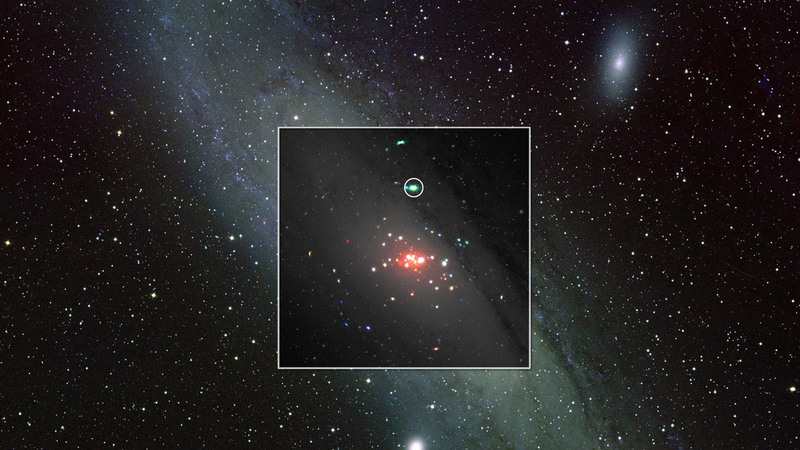 Commenting on the findings on behalf of the Swift team, Stefan Immler at NASA’s Goddard Space Flight Center in Greenbelt, Md., noted that it was almost exciting enough for astronomers to witness a new ULX so close to home, even if “close” is a few million light-years away. “But detecting the jets is a real triumph, one that will allow us to study the accretion process of these elusive black hole candidates in never-before-seen detail,” he said. 1 Comment on "First Detection of Radio-Emitting Jets from a Stellar-Mass Black Hole Outside Our Galaxy"
Just wish to say your article is as amazing. Thanks one million and please keep up the gratifying work.